Learn how to plan a perfect site and master the art of A/B testing in net #286. Plus, get a free 148-page guide to WordPress! Designing a perfect site isn’t just about letting your creative juices run free. 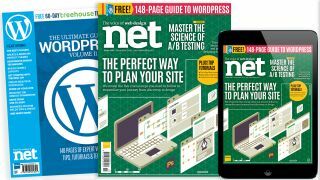 In the new issue of net, Anna Stout shares five critical steps you need to complete before you start designing, to ensure a site that is easy to use and will convert users. Nail your research and planning, Anna argues, and your site is guaranteed to be better for it. Once you get to the design stage, how can you be sure your design is the best it can be? In the second feature, Michel Ferreira takes a deep dive into A/B testing – or as he presents it, ‘the science of good design’ – and shows you how to gather figures that prove your design is (or isn’t) working. In the Projects section you’ll find clear and in-depth tutorials on building progressive web apps, accessible web typography, React and PostCSS. What’s more, this issue all readers will receive an 148-page WordPress guide ebook, jam-packed with expert tips, tutorials and techniques.